I trust you are well and your worm farm is flourishing. We often get questions by concerned worm composting friends about the occurrence of fruit flies in worm farms. There are actually a few ways to dramatically reduce the fruit fly population in your worm farm. Although they are essentially not harmful to the worms they can become a nuisance if they are allowed to multiply. They can be identified by plump bodies that are usually pale brown or orange and a slow flight. They are between 1 to 2 mm / 64th to 32nd of an inch big. Follow the steps below to reduce or even eliminate the fruit fly population in your worm bin. 1. Take a large empty Soda plastic bottle, cut of the neck just above the place where the round turns into the straight line. 2, With a sharp nail or scissors punch 5 or 6 holes 2 to 3 mm / 32nd to 48th of an inch in diameter into the side walls of the bottle about 10cm / 4 inches above the bottom of the bottle. 3. Throw a few banana skins into the empty bottle. 4. 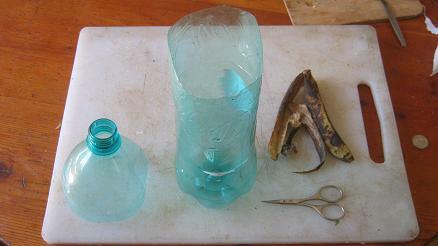 · Attach the funnel top to the bottle base with some clear sticky tape. The book explains in detail all you need to know to create an income with your earthworms! It is exceptionally low priced at the moment available as a printed soft cover book at Amazon or a Digital version on the "Kindle"
You can prepare a few of them slightly modified and place them in different locations to find out which works best. If you have further questions or suggestions please feel free to contact us. We love to hear from you. Till next time.